Last weekend, I attended PAX East with the expectation of providing information on the many games on display. While I wrote up my impressions on some of the games I played, I got struck down by the PAX plague, con crud, or whatever you want to call it, and was unable to talk about all the ones I wanted to. So, to make up for that, here’s a quick rundown of some of the more interesting ones from the show floor. 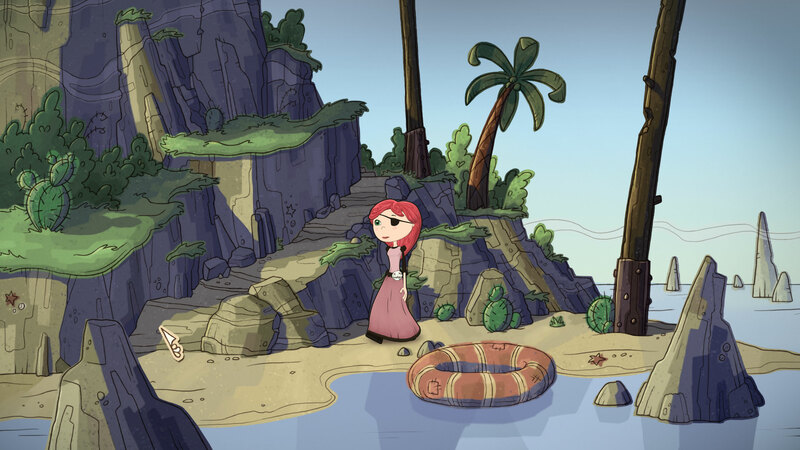 Nelly Cootalot: The Fowl Fleet is a 2D point-and-click adventure game that follows in the tradition of the classics of the genre, but modernized to include full voice acting, hand-drawn artwork and less frustrating gameplay. The game is actually a follow-up to Nelly Cootalot: Spoonbeaks Ahoy!, which was released in 2007, and features the return of the titular pirate heroine as she tries to save a flock of birds from the evil Baron Widebeard. The game is rife with humor, mostly puns and classic British dry wit. One example is the initial setting: a mail ship named Undeliverable. While playing through the demo, I found the characters to have their own special charm which adds to the whimsy. And there are a lot of characters. The gameplay is easy to pick up. You walk around, examining objects to pick up clues as to how to proceed. As an added bonus, you don’t need to be pixel-perfect with your clicking in order to examine something, close enough works just fine. Occasionally, there are puzzles to solve, which can take a bit of time to figure out, but overall weren’t that tough. Nelly Cootalot: The Fowl Fleet is coming to Steam for PC, Mac and Linux. There are a lot of games out there that let you be a cat, but how many of them have you acting like a cat? 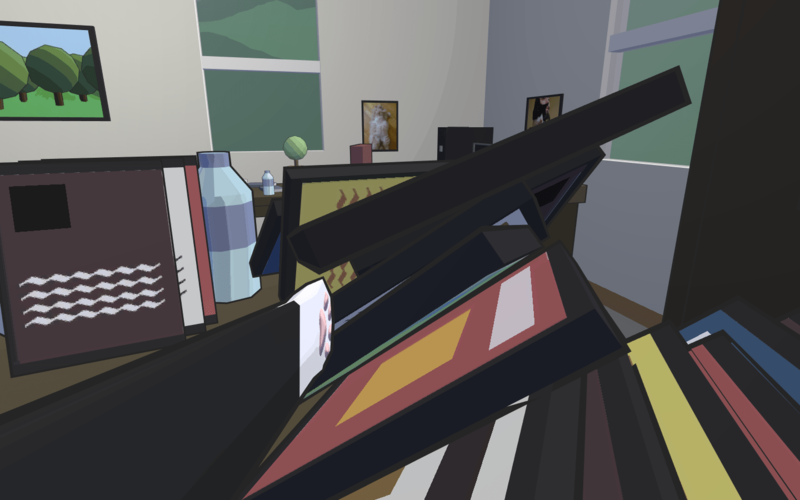 Catlateral Damage is cat simulator where you walk around the house in first-person view and do what cats do best, namely jump up on furniture and knock stuff over. It’s not that simple though, in the demo I played, you are actually under a timer, and given a score based on how much destruction you cause. As you wander through the house, fairly simple controls allow you to swipe at or push objects. You can also bite certain places either for destructive purposes or to pick up items and carry them around. You can adjust the camera angle to look around as well. It’s not as easy as it sounds. The timer runs out quickly, plus I spent way too long fiddling with the camera as I could never quite find that sweet spot that let me see both where I was going and the objects in front of me I wanted to knock down. However, I’m not going to let one botched demo run ruin my expectations. Catlateral Damage will be out on Steam on May 1, 2015. One thing I really like about indie games is their potential to go beyond being mindless entertainment and actually invoke thoughts and feelings in the player. Like how a good Star Trek episode leaves you thinking about contemporary issues, Ninja Pizza Girl is similarly profound. 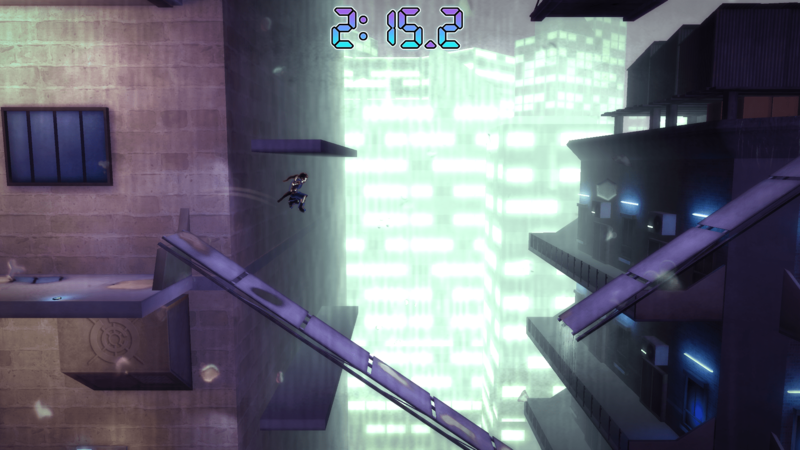 Ninja Pizza Girl is a fast-paced platformer, where you play as a teenage girl named Gemma, who delivers pizzas for her father’s shop. The demo started out with you having just a couple minutes to get the pizza to its destination before it grows cold. As you run along the sides of apartment buildings, you can hop from balcony to balcony and use makeshift platforms and trampolines to reach higher levels. There were arrows guiding you to make sure you stayed on course. After delivering the pizza is when you first encounter your opponents, “pizza ninjas” from the rival big chain pizza shops. After a humorous exchange, it’s decided the best course of action is to run. Of course, that’s pretty much all you can do anyway since you don’t have any weapons. If you get hit by any of them, they’ll attack with something that has harmed many over the years: words. Yes, in this game, your enemies are bullies and you’re trying to get away from them. Getting knocked down will allow a barrage of insults and laughter to crush Gemma. This works itself into the gameplay as the longer she is exposed to such ridicule, the tougher it is to get up, and the slower she moves, as if her self-confidence and will-power were being drained. You can even see world around her start to get dreary and gray. You’ll need to get a safe distance away before things can return to normal. The implementation of this mechanic feels really natural, and there’s enough humor to keep it from getting too heavy. I never felt that the game got preachy about the issue, but it does give you something to think about as you walk away, which, in today’s climate where bullying is rampant both online and off, seems like a good thing. Ninja Pizza Girl is coming to Steam, Wii U, Xbox One, PS4, PS Vita, iOS and Android in 2015. 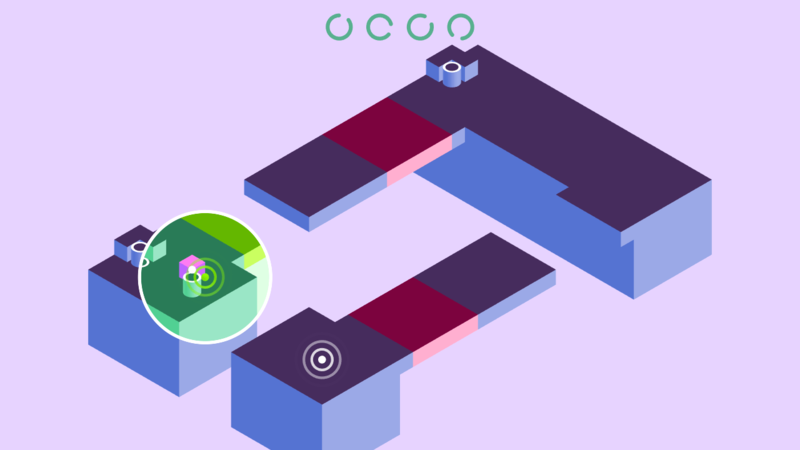 When it comes to puzzle games, it’s tough to find one that adds anything new to the formula. Induction is one game that does add something new: time travel. You are in control a little square block that rolls around on various platforms. There are little cylinders that you can push onto designated spots to activate a bridge to reach a disconnected platform. To add a layer of complexity, you can view your past self moving along the same path you did. This allows past you to activate something that you need to continue in the present. This isn’t as confusing in-game as it sounds. Either that or I’ve watched way too much science fiction for my own good. You also have the ability to manipulate time. You can reverse time if you make a mistake, similar to how it works in Braid, and you can speed up time if you’re waiting for your past self to do its thing. The puzzles themselves were challenging, but not too difficult. And the minimalist visual design allows you to keep your focus on the problem at hand. One of the more intriguing games I saw at the Indie Minibooth was The Hole Story. This game is actually the Grand Prize winner of the Girls Make Games competition last year. As such, seeing it at PAX East certainly peaked my curiosity. 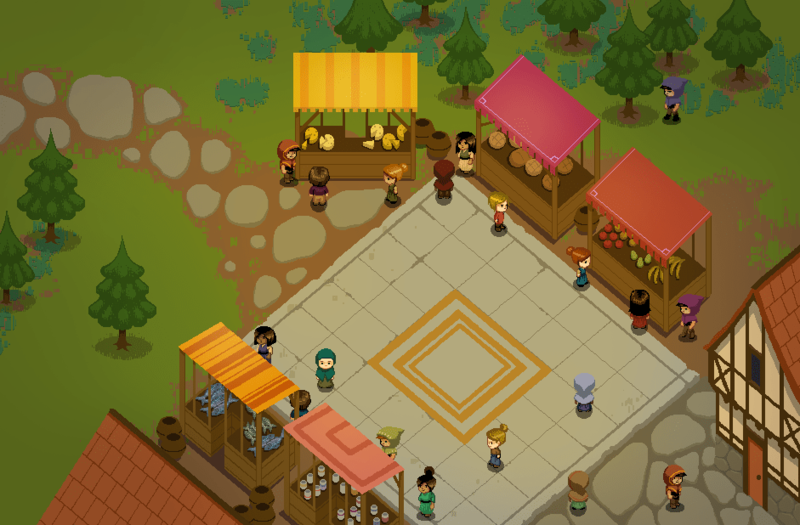 The Hole Story is a fantasy RPG adventure game that has you solving riddles to advance. Instead of relying on typical fantasy tropes or RPG clichés, you can see the game used ideas fresh from the imagination of the youngsters who designed it. You play as a girl named Wendy, who was digging in her yard and accidentally traveled through a portal to an alternate dimension, where she gets mistaken for the land’s princess who has run away. This princess actually has a legit reason to run away, not just because she was bored or was told not to. Unicorns will help you along the way, but only if bring them what they ask for in the form of a riddle. The riddles weren’t too difficult, for example one asked for something that “gets wet as it dries”. The art was particularly beautiful, with bright colors and careful details. I really liked that even though this game seemed familiar, it also felt different from other games I’ve played before. I’d say the next generation of game developers are off to a good start. The Hole Story will be out on Steam for PC, Mac and Linux. Twelve Minutes brings a unique twist on the point-and-click genre. You play as a man stuck in a time loop, repeating the same twelve minutes over and over, in real-time. Each time, you must use the information you learn to help you advance further in the next iteration. The developer made the comparison to the movie Groundhog Day, and I can see why. The overall feel is much darker than other games I’ve talked about. You come home from work and are sitting in your apartment with your wife about to eat dinner. Your first main obstacle in Twelve Minutes, is that a police officer will come to the door and arrest your wife for murder. This ends the day and the next iteration on the loop begins. Since you have knowledge of what’s to come, you can now begin to search the place for clues and interrogate your wife about what will happen. I tried a number of things and couldn’t figure it out, even after watching a few players ahead of me try it and fail as well. The game presents enough of a mystery that, despite its difficulty, you want to continue to push through until you do find a solution. 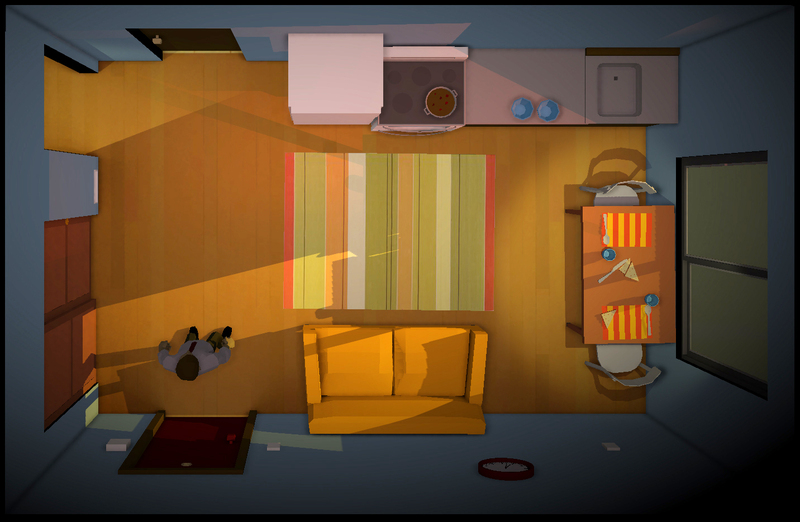 Twelve Minutes will be out for PC and Mac in 2016. Well, that’s it. What do you think of these games? If you were at PAX East, what cool indie games did you play?